I started my sourdough baking adventures in March. After just one loaf, I knew this process was going to become a hobby and passion of mine. 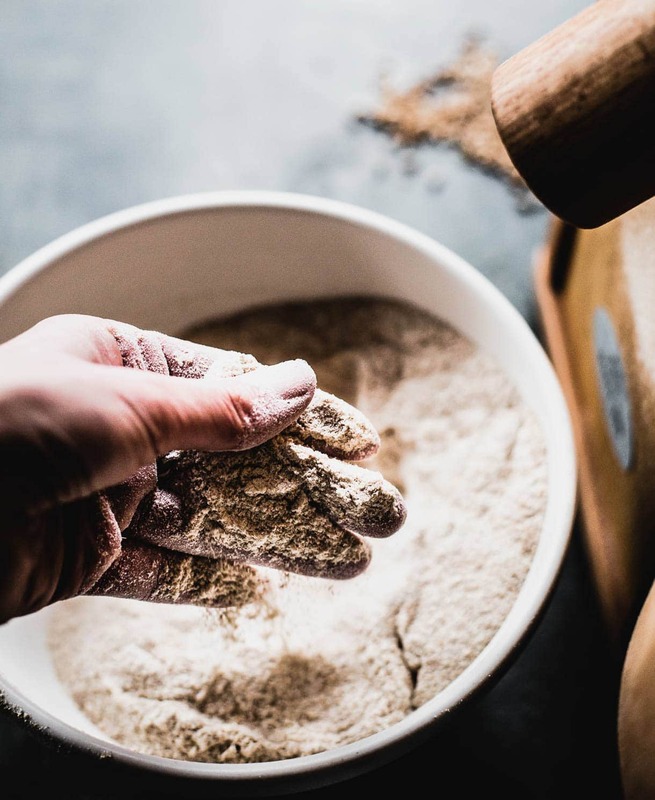 I’ve never been so fascinated in my own kitchen, nurturing and fermenting a live starter (click here for my top 5 sourdough starter tips) on my counter and transforming it into the most delicious bread I’ve ever eaten, with the addition of just flour and water. A golden, crunchy, caramelized crust. Holes scattered through the soft crumb. A touch of tang, but mostly yeasty sweet. 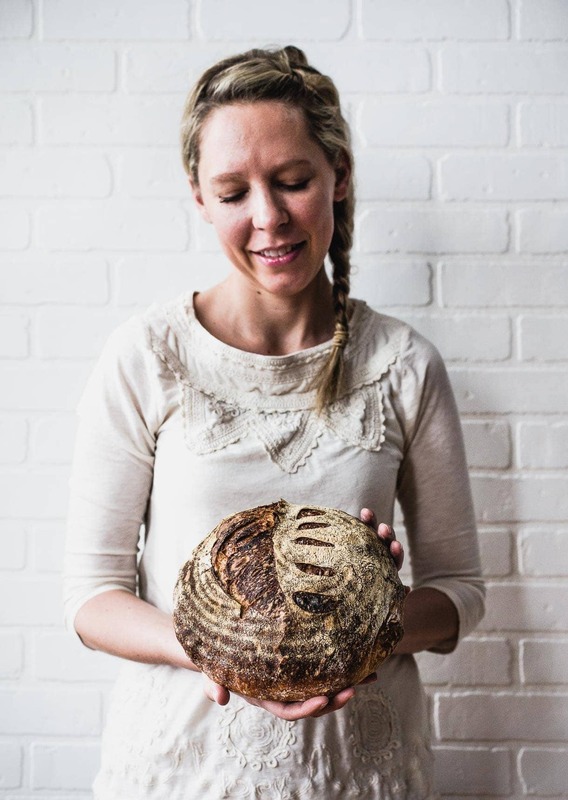 It’s the way bread was made centuries ago, and I’m so glad that many around the world are embracing sourdough again, and sharing their learnings with others. My starter has become a part of me…. It needs to be fed. It asks to be used. The long rise. The satisfying bake. The first slice of whole wheat sourdough bread. As I continued to learn about sourdough bread, I also started to research using fresh milled grain. Like other things that we buy on the grocery shelf, it’s hard to know exactly when the flour was milled, or where the grain came from. And I was really curious as to the complexity that whole grains would add to the bread. I had some experience with home milling, as I acquired the WonderMill grain mill about 6 years ago. I milled only gluten-free grain, and had good end results, but the mill was extremely loud and I didn’t like how the flour flowed into a bucket that had a “hose” coming from the main mill. It got messy. Additionally, it wasn’t the prettiest machine to look at, made of hard plastic. Pleasant Hill Grain has lots of kitchen equipment, and is the exclusive US importer of Austrian made Komo Grain Mills and Flakers (mill is left side of machine, flaker on the right) you see here in the photos. 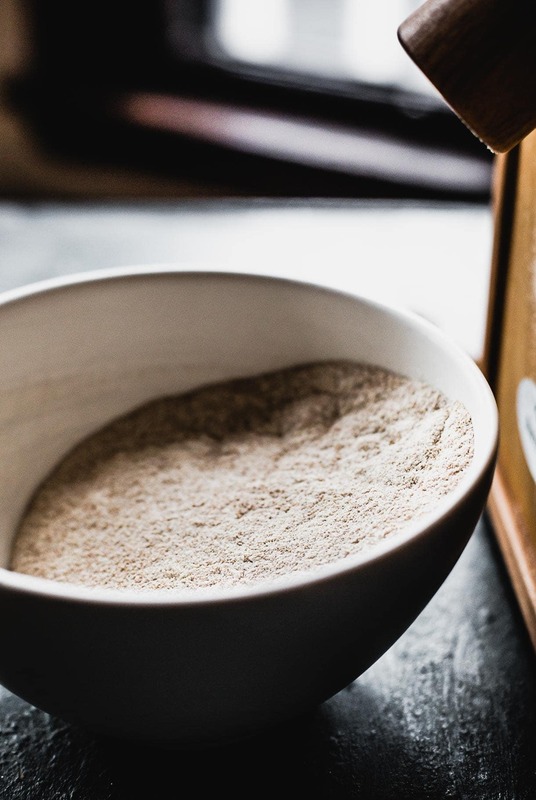 We are working together to start more conversations around home milling, the benefits of using fresh flour, and how easy it is. For sourdough bread, you’ll want to grind it as fine as possible. With the Komo Mill, all you have to do is turn the top hopper as far to the left as it goes before the stone burrs touch each other. Flip the switch to turn the mill on. Pour grain into the hopper, and tada – FRESH FLOUR! The grinder side mills hard or soft wheat, rice, kamut, spelt, buckwheat, barley, rye, millet, teff, quinoa, amaranth, sorghum and dent (field) corn. It will also grind lentils, dry beans (pinto, red, chickpeas, kidney & more), and dried, non-oily spices. It isn’t suitable for herbs, oilseeds like flax or sesame, popcorn, or fibrous materials. The grain flaker side (shown above), is incredible too! Wheat, rye, barley, and most commonly, oats are flaked. 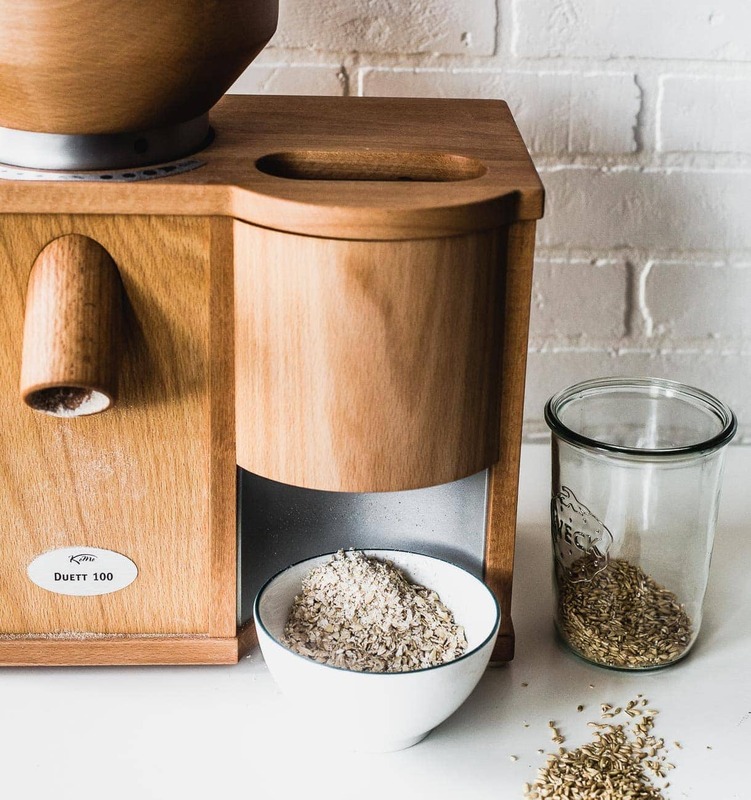 When you press your own oat flakes, you’re getting fresh, raw oats with all the delicate essential oils and life energy of the seed. That’s compared to commercial oat flakes, which are steam cooked and heat dried to preserve. Other grains that are normally dry and hard should be softened by briefly rinsing them under water. Then spread the grains on a cloth or towel to let them dry over night or for at least 3-4 hours. 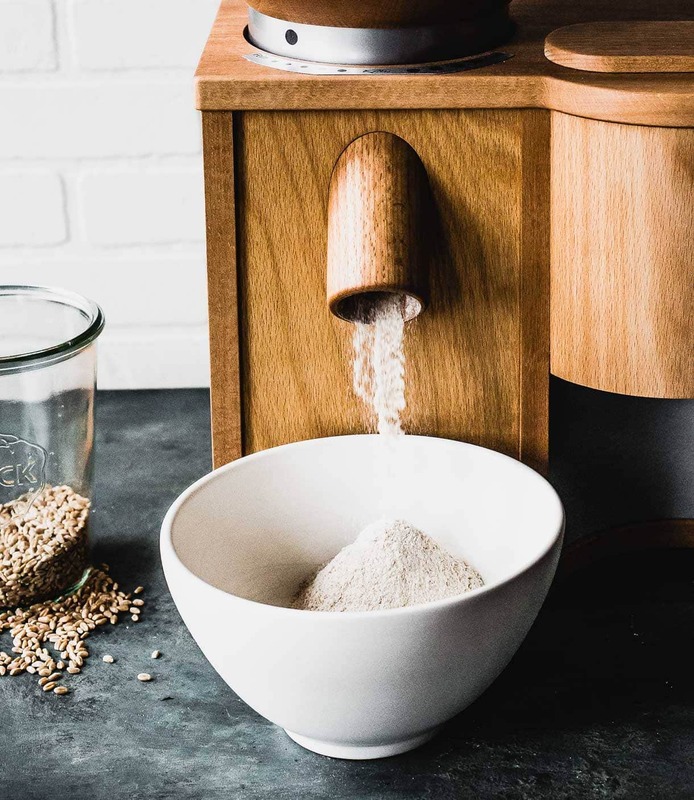 Milling your own flour, without sifting, means you retain 100% of the same wheat berry in your end product. Many mills will label using the term “whole wheat”, but that doesn’t always mean whole grain. Additionally, they will sometimes perform several milling passes, especially on the germ and bran which are sifted out and then later added back in. 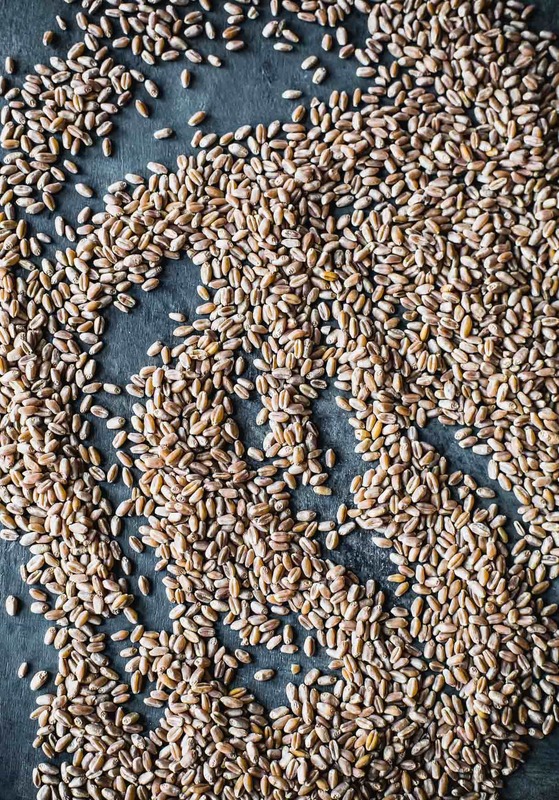 Once the wheat berry is milled, breaking open that protective bran layer, oxidization begins which causes nutrients to slowly degrade. So when we mill at home and use the flour immediately, we’re retaining many more nutrients that store bought flour. But where fresh milled flour really shines is in flavor. The complexity and nuances of each grain comes through, deeply rich and nutty. I’ve baked with both fresh milled hard red winter wheat, and spelt, and loved each. The crust, crackly, and shinier! The crumb is so so tender, softer than an everyday kind of loaf. When doing these two things, I achieved the oven spring I was hoping for, and nice holes near the edges of the loaf, with a tighter middle. It’s so wonderful for toast and sandwiches. You’ll notice that there is still bread flour and all purpose in this Whole Wheat Sourdough Bread recipe, because they both lighten the loaf and help the structure because of the higher protein content. These flours also help with volume. 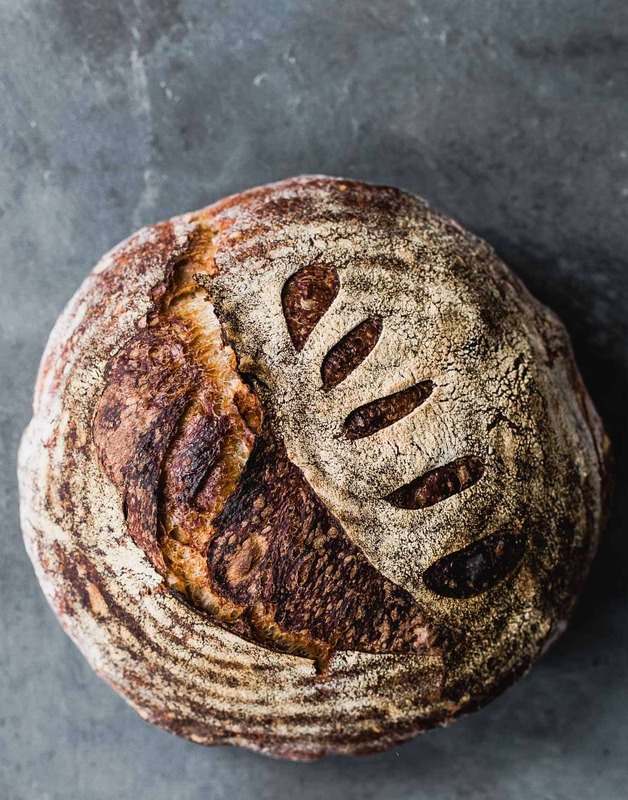 My Whole Wheat Sourdough recipe is adapted from the Artisan Sourdough Made Simple cookbook, which has been my guiding star throughout this whole sourdough learning process. I highly recommend it! In a large bowl, whisk starter, water, and honey. Add the flours and salt, mixing first with a fork, then switching to your hands. A rough, sticky dough will form. Cover with a damp towel and let rest for 1 hour and 15 minutes (this is the autolyse). Then work the dough into a semi-smooth bowl, folding it over itself for about 1 minute. Bulk Rise: Cover the dough with a damp towel, dusted with flour, and let rise at room temperature (as close to 72 degrees as possible) for 1 hour. Complete a set of folds, then let rise for another hour. Complete a set of folds, then let rise for another hour. Let rise for 2 hours, then complete last set of folds. Then let rise for 3 more hours. (This a total rise of 8 hours). Now it's time to shape. Gently coax the dough onto a flour surface. Shape it into a rustic round and let rest, covered, for 15 minutes. Then shape the dough using this method, into a tight round. Using a dough scraper, transfer the dough, seam side up, into a banneton. Cover, and let sit in refrigerator for 8-10 hours. Remove dough from refrigerator and let warm up for a half hour. Meanwhile, preheat your oven to 475 degrees. When dough is warm, Cover with a piece of parchment and flip so that seam is now on the bottom. Lift banneton off. Gently rub a bit of flour onto the top, and score the dough. Cut parchment into a circle around the dough, leaving a 2 inch overhang. Lift parchment into a dutch oven and make sure parchment is not covering the dough. Put top on dutch oven. Slide into oven on middle rack, and bake with cover on for 20 minutes. Remove cover and bake for another 30 minutes, until exterior is golden brown and crispy. Let cool for one hour before cutting. Store bread in a plastic bag, cut side down for up to four days. 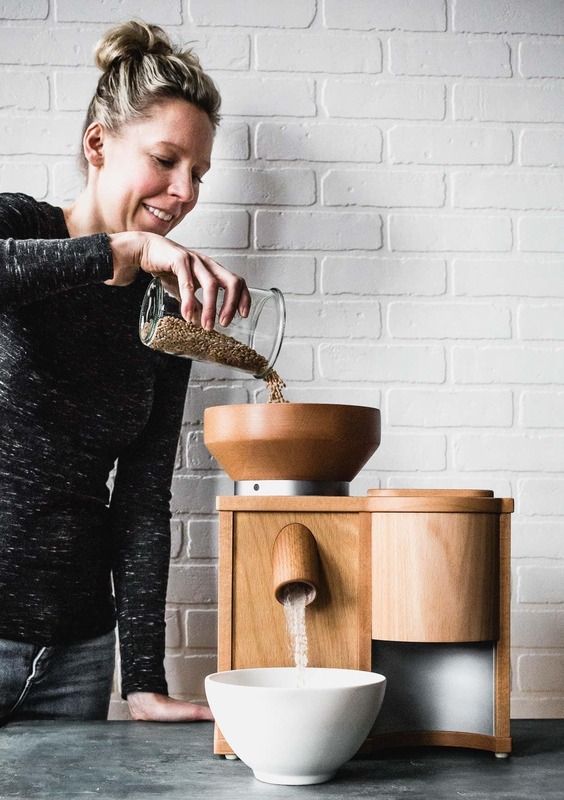 This looks like SUCH an incredible kitchen appliance for an even more incredible recipe! Lately I have been loving making my own baguette bread but I really want to aim to create an amazing whole wheat sourdough bread. This is going to be such an amazing new project to tackle! I just have to figure out how to make a good starter or buy one! I truly fell in love this the mill at the first glance. It’s so beautiful and useful as you have showed! I’ve never thought of milling the flour be myself but if I do one day, this is absolutely the first option coming out in my mind! It’s so dreamy! Unlike so many other appliances, it’s as beautiful as it is functional. Hope someday one graces your home! awesome! i hope it goes well for you. i find that whole wheat doesn’t quite get the same oven spring, but the crumb is so wonderfully soft and flavorful. Just to follow up: This sourdough was PERFECTION. I can’t believe how good it turned out! I’ve made sourdough in the past, but always had a problem getting that buoyancy in the crumb. My husband loved it too, and we ended up making grilled vegetable/chicken salad sandwiches with a green sauce. It tasted gourmet because of the bread! Thank you. omg, yay!! i’m so glad it was successful for you. thanks for letting me know! As a first time bread maker, this recipe was fantastic! I couldn’t be more excited with the turn out. I was so excited to slice into it and to not only learn that it was soft but that it was edible as well (my friends have told me horror stories.) 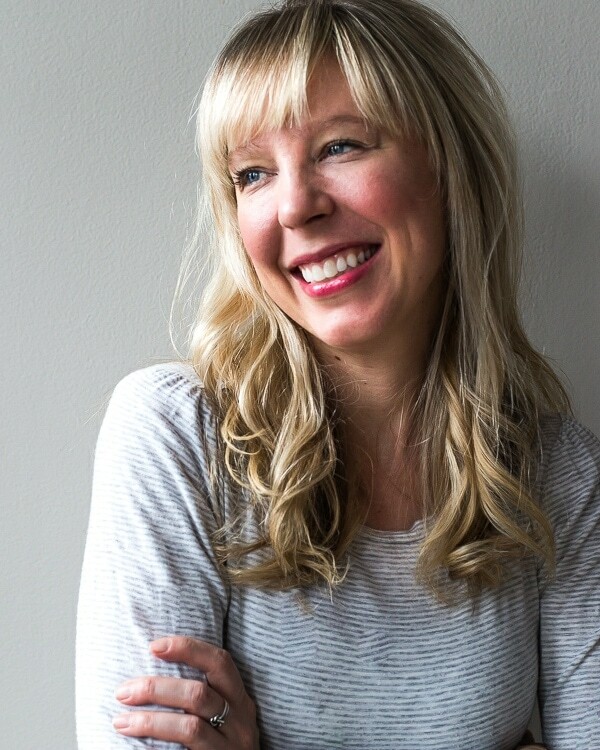 Thank you thank you thank you Amanda for providing such a wonderful guideline. Hi there! I’m headed out of town (flying) and I would love to make sourdough while I’m away. Do you recommend bringing starter, making the dough and baking when I reach my destination or just baking the bread at home and bringing it with me? Thanks in advance! Hello! You could really do either. If you plan on eating it a day after fly, it will stay fresh baking whole and carrying on, then slicing when you get to destination and storing in plastic bag. If you plan on it being a few days in between flying and when you’d want to eat the bread, say 3 or so days, you could bring your starter along. However, then you are unfamiliar with the oven you’d be baking it in and the tools available to you. Hope that helps! I’m going to try the bulk rise and shaping the dough prior to fermentation as you suggest. I’ve been shaping the loaf after the fermentation process. Meanwhile I am wondering if you preheat the Dutch oven? I have been using a pizza stone with steam under it because the Dutch oven kept burning the bottom of the loaf. I do not preheat the dutch oven, as I did some research on that and it does not affect the rise negatively, however like you said, the bottom of the sourdough loaf can burn. Hope you love this recipe! Let me know how it turns out for you.